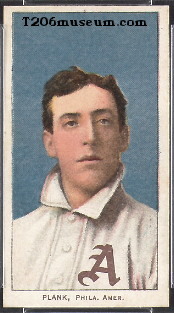 Eddie Plank was the pitching star of the Athletics. His T206 Plank card follows a distant second to the Wagner in terms of scarcity. The mystery behind Plank's scarcity is not known and numerous speculations have been made. The story was always that the printing plate broke early in the press run. But since the card can be found in both the "150 Series" and "350 Series" and almost conclusively shows that the image of Plank went to press at least on two occasions. (This broken plate story was made in the early state was because this card has previously been known only in the "150 Series"). Perhaps the "negotiation" suggestion among with Wagner is more convincing than the broken plate theory. However, it is impossible we will know for sure. 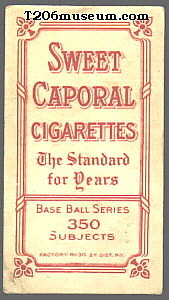 Majority of T206 Eddie Plank known to have Sweet Caporal advertisments and can be found in either 150 Series or 350 Series and only three T206 Plank known to have Piedmont 150 Series back. There are approximately 100 examples known to exist.